Deciding when to tell your child about his diagnosis is difficult. It is such a personal thing and no book can possibly give you the correct answer as to when is the perfect time. Believe me, I read them all so I would know if they did. But there comes a time when you just have to do it. Our time was last year. Jay was in Third Grade. Jay’s teacher was the one who told me it was time we should tell him. She said that Jay was starting to realize that he was different from the other kids and that perhaps he was confused about it. At first I was angry. How could this woman possibly know this and I, his mother did not. In retrospect I believe I was angry because I knew she was right. Jay had started having terrible spells of not sleeping. He would get to sleep fine, but he would wake up and just not be able to settle himself. Because he was tired, the littlest thing would set him off. He was melting down often at school and at home. Something was going on. Of course when we asked him, he just did not know how to explain it. I knew his teacher was right… we needed to tell Jay so that he would understand some of these differences. But how, how do you tell your child? We were living overseas so resources were limited. I did find a series of books online though that I thought might help. The book is written as a mystery novel for kids and it is called, “BLUE BOTTLE MYSTERY: An Asperger Adventure” by Kathy Hoopman. I read the book myself first and then thought it would be a good idea to read the book as a family. My thoughts were that Jay would immediately be able to relate to the book’s main character, Ben, who finds out he has Aspergers. But Jay did not see any similarities… Grace, who was only 6 at the time, immediately caught on. That actually was an “Ah Ha” moment for me. The fact that Grace who was so much younger could make the connections but Jay could not. That is what Aspergers is all about in a way. We finally had to not be so subtle and just came out and told Jay. At first he did not get it. We told him there was nothing wrong with him, it was actually a gift because having Asperger’s meant that his mind thinks differently than other people and that is an incredible thing. We researched all the incredible people who have been said to have or had Asperger’s and he started seeing how thinking differently could be okay. We talked about the other kids in school and how they may not get him. That was when he finally started opening up. He was in deed noticing differences. Three weeks after we told him, the sleepless nights went away. About a month after we told him, Jay’s teacher started insisting that he tell the class. This is where the problems started for us. My husband and I could not figure out how him telling the entire class would possibly make things better for him. The only person whom I thought it would make things better for was the teacher. If Jay had a meltdown all she would have to do was remind the class that he had Aspergers. Jay was having a hard enough time dealing with the kids in his class, why give them something else to use against him. And Jay did not want to tell the class. He did not feel comfortable enough with this new-found information. “I don’t know how to answer their questions if they have any mommy.” he told me one day. The teacher was insisting and even told Jay that the kids could write down any questions they may have and that he could take them home to think about them. The sleepless nights came back. Before this time, I was Mrs. Nice guy. I had always been the type of parent that the teachers loved. In fact I had been told that the teachers actually fought to have my kids in their class because they knew I was a great room mom and huge help. But there comes a time, when you just don’t care what the teachers, or anyone else for that matter, thinks about you anymore. All I cared about was Jay and getting this woman to Lay off! So I went over her and straight to the administration. I did not care what the consequences to her were, I just wanted her to stop pressuring my son. I was an emotional Mama Bear who would do anything to protect her cub. I now know that approach was probably not the best approach. Sure I got the results I wanted, but at what cost? You see the thing us parents need to remember is… how we act certainly does affect the way the teacher will interact with our kids. Don’t get me wrong… I am still going to be an advocate first and always for my son and my daughter… but there are ways of going about it. This teacher was not a monster. She truly did believe everything she was doing and saying was in my son’s best interest. And honestly she was right about many things, like us telling him. I take responsibility for it being a hard year for Jay. I know I could have worked with this teacher better. And that is what it is… working with them. Or maybe even if I did things differently… we still would have butted heads. Bottom line is, there will be years that we will have some really great teachers (like this year thank g-d! I LOVE JAY’s TEACHER with a huge Capital L) and there will be years that will not be so smooth. As a parent, it is my job to help make those not great years a little better. Keeping my emotions in check will help some I think. But just in case, let me apologize now to any future teachers who just happen to get on the bad side of this Mama Bear! Yes, there are good years and bad years. You did a great job of handling that year! The school system we’re in seems to be pretty guarded about diagnoses, at least at the elementary level, and I have not encountered anyone suggesting that my son tell other kids in his class. I know he certainly would not want to either. We told Thomas that he had Asperger’s at the end of third grade. I had asked the doctor when would be a good time to tell him and he said we would probably just know but suggested doing it before the middle school/junior high years. Well, we didn’t have an “Aha” moment really, but he was aware that certain things (loud noises, large groups/assemblies) really bothered him and didn’t bother other kids and he was sad. So we gave Thomas a brief explanation (I still remember the look on his face—he was horrified and initially thought he had some disease and was dying). 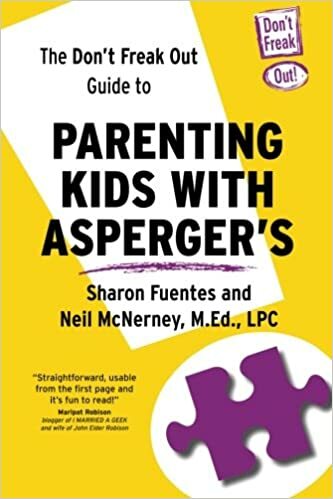 And we left a book with him to read: Can I Tell You about Asperger Syndrome by Jude Welton (only 48 pages, written for children). At first he didn’t want to read it, but eventually he did and he seemed relieved to know why he has the feelings he does and why certain things bother him and not other kids. Love the look of the new page BTW! Hi I found your website by mistake when i searched Yahoo for this issue, I have to point out your site is truly valuable I also seriously like the layout, its superb! Thank you Elza… if you read one of my older posts about Signs… it says that I believe there is no such thing as accidents… everything happens to for a reason. So welcome and I hope you continue to keep logging on and read.